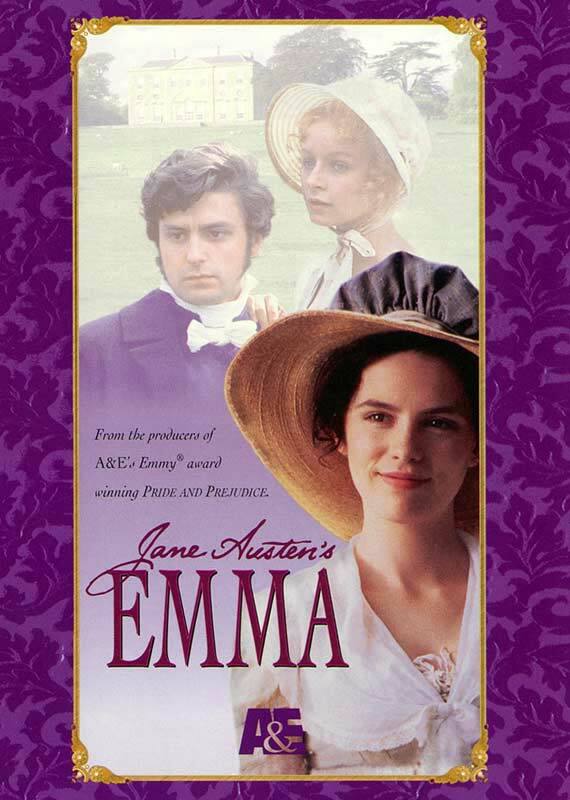 There are several things that set Emma apart from Austen’s other heroines, like Lizzy Bennet or Anne Elliot. Emma is the only one of the six (seven, counting Marianne Dashwood, eight if you count Jane Bennet) major heroines for whom finances aren’t a problem. Emma is wealthy. She doesn’t need to worry about securing a good marriage to ensure a comfortable future. In fact, Emma informs her protege, the poor Harriet Smith, that she plans never to marry, because she doesn’t need to. Emma is also the first in precedence in her neighborhood/social circle. She is the woman everyone admires and defers to, so that when she deigns to bestow her time and attention on Harriet, the foundling orphan who grew up in a nearby girls’ school, it is seen as an act of great benevolence. Emma is more closely related to Miss Caroline Bingley or Elizabeth Elliot than to Lizzy or Anne—she thinks more highly of herself than she should and looks down upon those she considers unworthy or beneath her. Yet Jane Austen manages to redeem her in the end. The metaphoric mirror is held before her, and she realizes the bad judgment she’s used, the awful way she’s treated people, and the fact that she may have lost her only chance at real love—and admits that she deserves to lose him. But never fear—an Austen hero always comes through in the end! Here, again, there are differences that set him apart. Mr. George Knightley is the oldest of all the Austen heroes, yea, older even than good ol’ Colonel Brandon with his flannel waistcoats. Mr. Knightley is thirty-seven years old, to Emma’s twenty-one (similar to Col. Brandon’s thirty-six to Marianne’s seventeen). He has known her since she was born, lived a mile away at Donwell Abbey all her life, has been a frequent and welcomed visitor over the years, and is related to Emma by marriage—her older sister to his younger brother (unlike Fanny and Edmund from Mansfield Park, who are first cousins and have lived in the same house since she was eight years old). Like the other Austen heroes, he is driven by his high morals and his concern for those less fortunate than himself—and by his love for our heroine (though we’re never really sure why). There are several other important secondary characters, primary amongst them are Harriet Smith, Reverend Elton, Frank Churchill, and Jane Fairfax. But I’ll let you watch the movie to figure out their characters. Gwyneth Paltrow brought a petulance and haughtiness to the role that made her into more of an ice-queen than I believe is found in the characterization in the book. And I didn’t quite believe her reformation in the end. Kate Beckinsale gives the superior performance of the two, in my opinion. She is a little more snarky, but it comes across less as being cold (like Paltrow) and more as a defense mechanism—to hide any sense of vulnerability she feels, because with her position, she cannot show weakness. And, frankly, I happen to think Kate Beckinsale is prettier. Ever since I first saw The Net back in 1993 or ’94, I’ve loved Jeremy Northam. He was the saving grace of the theatrical version of Emma for me, even though I’m not sure his interpretation of the character is spot-on. He does bring a little more lightness and good humor to the role than Mark Strong, but there are a few scenes when he’s just a little too light-hearted to do the character justice. But his “badly done, Emma!” scene makes me cringe every time, he’s so powerful. The first time I saw the A&E adaptation—after having seen the theatrical release—I wasn’t impressed with Mark Strong as Knightley. He was forgettable. He was stiff and formal and dry. But then, last fall, I saw Stardust, in which Mark Strong plays the delightfully villainous Septimus. Afterward, Ruth and I got to talking about him—about how much he reminded us of “that guy” who played Knightley in the Beckinsale version of Emma. Low and behold, it was the very same actor! So, is it weird that I now really like Mark Strong in this role because he was so good in Stardust? Or is it strange that the first notice I’ve taken of either of these actors was in a movie where they were playing the bad guy? Many years later, now, and more familiar with the story (I hadn’t read Emma before seeing either movie the first time), I have to say that Mark Strong’s potrayal is closer to how I imagine Knightley behaving when I read the book. Toni Collette—who is actually Australian, not British—plays a Harriet Smith who is a slack-mouthed simpleton. She cannot seem to come up with a unique thought of her own, and depends too greatly on Emma. Much of what was done to her character was done for comic effect, but it just makes the character look stupid, which she wasn’t. Samantha Morton gives us a much softer, more humble version of Harriet Smith. She pays attention to what Emma says because she respects Emma’s position, not because she can’t think for herself. And she fits the physical description of Harriet from the book much better. The weird thing about the casting of Polly Walker as Jane Fairfax in the theatrical version is that she resembles Greta Scacchi, who plays Mrs. Weston (her future step-mother-in-law). That, and she just looked too old for the role. I’ve really become an Olivia Williams fan of late. I think her look is a little softer, her demeanor more retiring, as is fitting for the character of Jane Fairfax. But, frankly, both actresses do an adequate job in the role. Yes, there is a reason I’ve saved Frank Churchill for last—and that’s because Ewan McGregor was so laughably bad in this role, I almost feel sorry for him. With as much as I love him in Revenge of the Sith (Star Wars #3), and with his wonderfully romantic performance in Miss Potter, he’s AWFUL in the theatrical release of Emma. Then, there’s the issue of the cat that crawled up onto his head and died there . . . I haven’t ever seen Raymond Coulthard in anything else. He’s a decent actor and fulfilled the requirements of the role much better than Ewan did. And if that’s not his real hair, it’s a much better wig than Ewan’s. I love it – so true and I agree! I am very much looking forward to Emma Sunday night and your post just added to the anticipation! While I’m not quite as unhappy with Gwyneth Paltrow’s performance as Emma, I agree with your other comparisons. One critic said that the theatrical film was more lushly produced; but I loved the natural lighting in the A&E version, and the details of daily life that are so casually included. I also loved Bernard Hepton’s take on Mr. Woodhouse more. His performance, even when he does not speak, is priceless. James Cosmo is too virile a man to play him, and I thought he was all wrong for the part. Jeremy vs. Mark? This is where I keep ping ponging back and forth. Both are yummy. One is more virile and darkly handsome (Mark), the other is more romantic. Eenie, meenie, minie, moe. I’ll take both, thank you. I’m so glad we’re back to Jane Austen on Sunday night. I thought I was the only one who noticed Jeremy Northam in The Net–you never hear mention of that role. I think I fell asleep while watching Emma–twice–because I just don’t remember it! Sorry for the strong views, but I thought Gwyneth was frsh Emma and quite tolerable (may be due to Jeremy Northam’s noble presence), but I do find Kate Beckinsale unpleasant and can not warm towards her. In the summer of ’96, when Gwyneth’s “Emma” came out, I was newly pregnant with my first baby. Jeremy Northam’s screen presence is so intensive that he always becomes a centre of attention. This requires real acting skills: to draw the attention of the audience on yourself, while not accentuating excessively your tone or mannerism. Kaye, I love your honesty. So refreshing that you have a decisive opinions! We agree on everything! That is a first for me. Keep up the good work. It’s hard work being brilliant!!! Oh, that bit was Emma sliping in. Haha, I love your description of Ewan’s hair as Frank Churchill! Except I always thought it looked like he was wearing a wig designed to look like a straw broom or something…lol! Likewise, my appreciation of Mark Strong as Knightley has grown since seeing him in Stardust (and Miss Pettigrew!). It’s a little weird that happened AFTER seeing him in other completely unrelated roles…lol! I thought Mark Strong was excellent. The way he slowly comes into view in each scene in a quiet way. It took a while for me to realize he was falling in love with Emma, even while he scolded her many times. Haven’t not read the book it was a big surprise to see them fall in love. Do you think he really went swimming with Mr. Darcy?